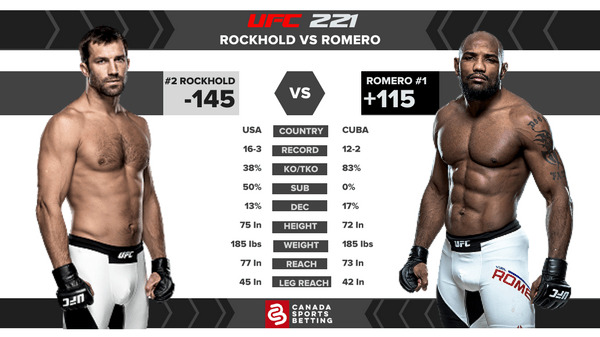 It is now or never for both Luke Rockhold (-145) and Yoel Romero (+115). This may be either fighter's last shot at gold as both lost their last championship fights. In Rockhold's case, he was on the wrong side of one of the UFC's greatest upsets when Michael Bisping knocked him out in one round. For Romero, he's eager to get a rematch against Robert Whittaker and avenge his closely contested defeat last summer. Rockhold opened as an underdog at +150 then quickly got steamed and is now at -145 with a bit more action coming in on Romero. This comes with good reason as the former American Kickboxing Academy fighter eats wrestlers like Romero for breakfast. Rockhold left AKA to "get out of his comfort zone" and this comes with both positives and negatives. But Rockhold has likely developed his defensive wrestling to the point he can neutralize most of Romero's takedowns. Despite his prestigious amateur wrestling background, Romero only lands 32.69 per cent of his attempts. Rockhold also has beaten other wrestlers like Chris Weidman and Jacare Souza. Romero is explosive at any point as evidenced by his consecutive third-round knockout victories. He can seemingly pull flying knee knockouts from out of nowhere. And when he gets top position, it's a wrap. If he has a weakness here, it's his lack of size and reach, which Rockhold will look to expose. Rockhold utilizes kicks and straight rights to keep his opponents at bay but when they do close the distance, he has an underrated clinch game. For a lanky guy, he is strong and hard to keep down or bully up close. Chalk that up to his experience wrestling with the likes of Cain Velasquez and Daniel Cormier. Most importantly, he has more ways to finish this fight. Prediction: the difference-maker here is Rockhold's jiu-jitsu. He can utilize this offensively and capture Romero's back or to get top position, where he rains down vicious elbows, or defensively, to prevent Romero from securing top position. Rockhold is the pick here to outlast Romero within four rounds despite running into some close calls throughout the fight. Lock it Up! With Tyson Pedro (-320) who will run through Saparbek Safarov (+235). Pedro is the superior fighter in almost every way: he's faster, more powerful, and more skilled. Safarov is tough and can get wild but doesn't have the power or skills to seriously threaten Pedro. Who's A Good Dog? Get on Ben Nguyen (+105) now while he remains an underdog because this is tremendous value for the superior striker. While Jussier Formiga (-135) only loses to top-five fighters, Nguyen has the explosive striking and aggression to hurt Formiga and he is unbeaten in Australia. Just Say No: to Li Jingliang (-170) versus Jake Matthews (+130), which is a fantastic welterweight scrap between prospects but is difficult to read based on Matthews' enigmatic persona. The Aussie has all the tools to be a top-10 fighter but can't put it together and Jingliang is too wild to keep your money safe. MMA is one of the best sports to bet on and even better: it is ripe with upsets. Canadian fans turn to these online sportsbooks, which gives them access to all their wagering needs. Read our reviews and find the right books for you.